A father has lost a damages claim against a London IVF clinic after his ex-partner forged his signature to use frozen embryos. The High Court found IVF Hammersmith was not negligent. The couple broke up in 2010 but some months later the woman asked the clinic to implant an embryo, which they had stored. The man, who can only be identified as ARB, said he did not give his consent and was tricked by his former partner. After the couple had a son together through IVF at the clinic in 2008, a number of embryos were frozen and they signed agreements annually for these to remain in storage. In October 2010, the mother handed IVF Hammersmith a 'consent to thaw' form, forged with ARB's signature. 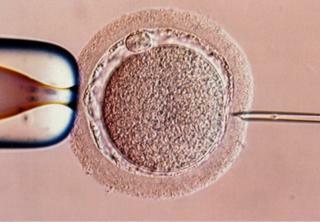 On the basis of this document, an embryo was thawed and successfully implanted. The father said his ex-partner's dishonesty resulted in the birth of his daughter, an "unwanted child". "It's a very, very difficult situation for me. A beautiful child, a child that everyone would want, a child that I love. But also a child that has brought us so much pain." He argued that the clinic should pay for the cost of her upbringing, including private school fees, holidays, refurbishing her bedroom and her wedding. The presiding judge Mr Justice Jay said: "Although he has lost this case, my judgment must be seen as a complete personal and moral vindication for ARB." "The same, of course, cannot be said for R." R was used to identify the mother in the case. Jude Fleming of IVF Hammersmith welcomed the finding: "As a clinic, we place patient care at the heart of everything we do. "We have been clear throughout that we have always adhered to the highest industry standards and met all statutory and regulatory obligations." But the judge said he did have concerns about the way consent was obtained by clinics during this time. The clinic said it has since reviewed its procedures to "ensure such a case could not occur again." The father said: "This claim has never been about money; it is about justice." He plans to appeal the decision regarding damages in the Supreme Court.